7256 Reseda Blvd., originally uploaded by Here in Van Nuys. It’s odd that even though America wasn’t looted, pillaged and destroyed during World War II the way much of Europe was, when major cities throughout that part of the world were being rebuilt in the 1940s and 1950s, they didn’t end up looking as tacky and charmless as what happened to so much of cities like Los Angeles. That would be one example of the way that the peculiarly poor sense of aesthetics common throughout LA, and elsewhere in the US, during the post-war years had an even greater negative impact than the effect of widespread pillaging and bombing. I don’t know what’s worse: the building’s fake-rock surface or its very cheap-looking concrete block walls. And, of course, there are the plain aluminum-framed windows and doors, widely acceptable and popular back then. What’s interesting is the store was selling merchandise directed at generally more prosperous customers. Yet very little attempt was made to appeal to such people, assuming they would be more demanding and discerning than the average bargain-hunting shopper. However, there are truly tacky, unattractive houses in the best parts of town, including in Beverly Hills, so I do admit it’s wrong to equate decent taste with lots of money. The “Tropical Fish” building appears to be a structure typical of those constructed over 40 to 50 years ago. I don’t know what’s worse: the dreary, rather low-budget stucco building or the utility lines hanging all over the place. 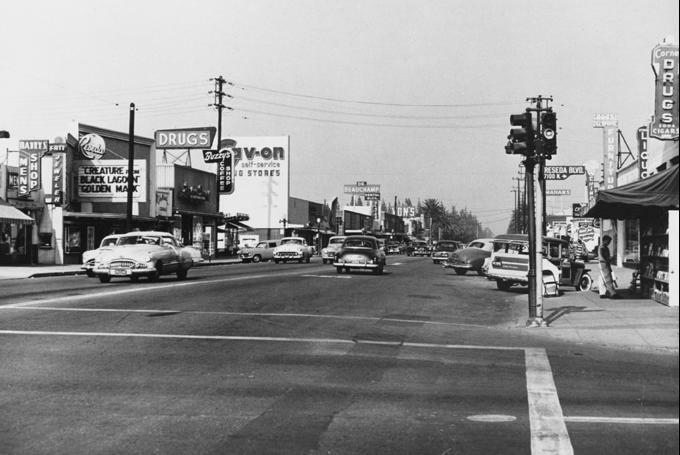 Why so many people had little sense of basic aesthetics or limited interest in creating a more attractive setting when much of the Los Angeles basin was first being developed is a major stumbling block (neighborhoods similar to 1930s Westwood unfortunately were the exception to the rule). A shortcoming that makes the city far more susceptible to stagnation or decline. A weakness that prods even more people to want to leave the old behind and run off to newer communities. Looks like Reseda has been waiting for something big to happen for many years. How many drug stores are in this image?